You are here: Home » Time for Pulp, Baby! The world is divided in two. Pulp…..or no pulp in the orange juice. The anti-pulp gang wants a smooth drink without having to pick something out of their teeth. The pro-pulpers like how the pulp makes them feel like they are drinking fresh, natural, home squeezed orange juice. I am a pulper in an anti pulp family. A number of years ago when I was going to the store my youngest, who was four, stopped me and asked me to get some orange juice. I told him I would and then he told me to buy the kind without the onions in it. Every time I go to the store for orange juice I walk to the cooler and have the internal debate. The angel on my right shoulder tells me that I should buy what my family wants and I should be a good husband and father. The devil on my left shoulder says, “Forget them. They should buy their own OJ. Time for pulp, baby!” As much as I favor the devil’s opinion, you can see that there is no pulp in the OJ in the picture below. The citrus brings a bright flavor. Thinner chops will cook faster. Sprinkle both sides of chops with cumin and garlic powder. 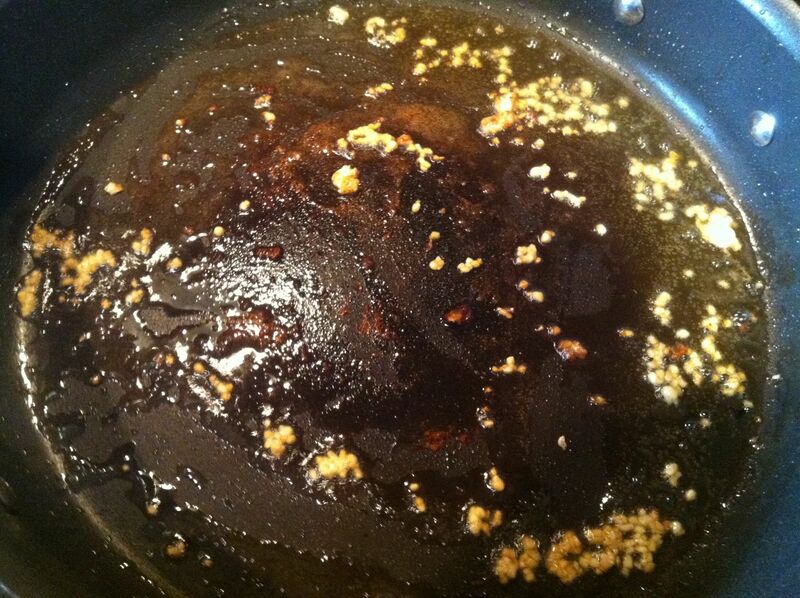 In a skillet, heat the olive oil over medium high heat. Add the chops and brown thoroughly on both sides, about 5 minutes per side. You want it to brown, not urn; check it to make sure it is cooking right. 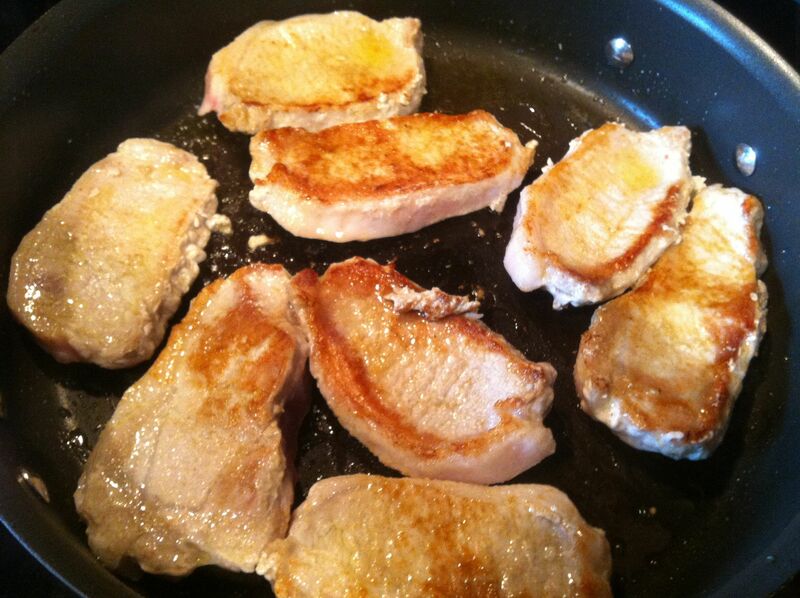 Remove chops from the skillet and keep warm. Into the skillet, add the remaining olive oil and garlic. Cook another minute, careful not to burn the garlic. Now add the orange juice, broth and lemon juice. 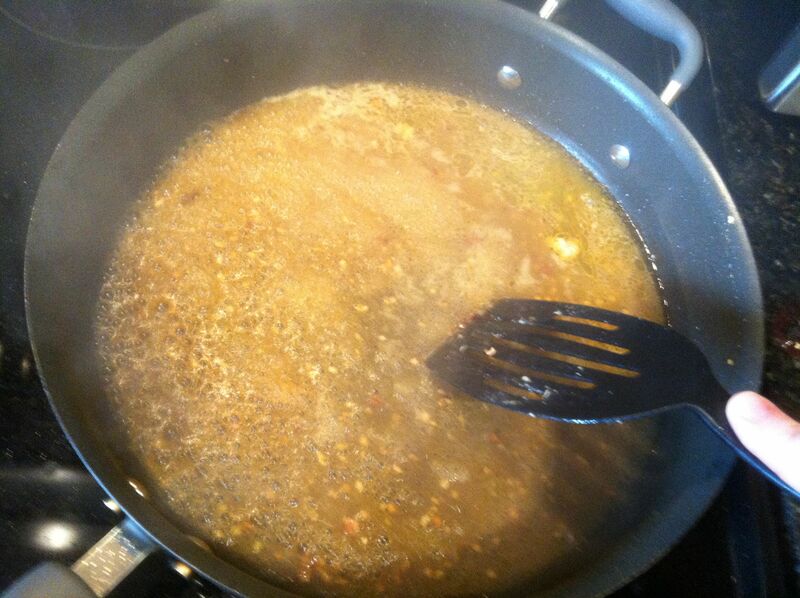 Using a wire whisk, get all the browned bits up off the bottom of the skillet and allow the sauce to come to a boil. Turn it down and let it simmer about 4 minutes or until reduced. Add the red pepper flakes and butter, and stir till butter is melted. Now add the pork back in (plus any accumulated cooking juices) and allow to warm up. Serve chops with sauce spooned over the top and cilantro sprinkled on top of that. I agree with you 100% Bring on the Pulp!! I literally laughed out loud at your son saying ‘the orange juice with out the onions in it’! 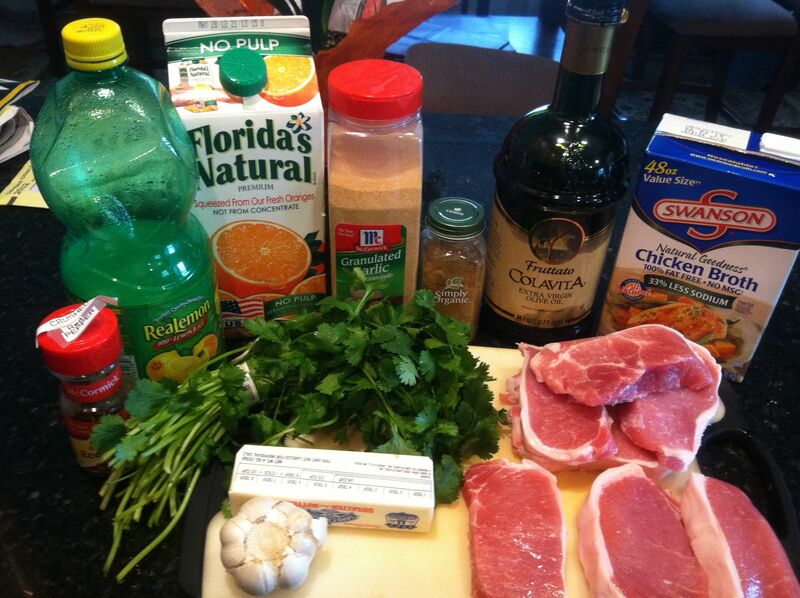 I have a fabulous recipe I make with pulp-full orange juice that my sons DROOL over, ‘Margarita Chicken’. Yes, of course. Created my own eats shoots and leaves situation…. That’s okay – my friend pointed out to me that I said coma instead of comma 😉 That poor baby! lol I still love your blog, though. ‘s all good. Love it, can’t wait to try it! Thanks for sharing! I live in a pulp free household too. My husband claimed he never knew I liked pulp. Blah! This looks delicious. I am with you–bring on the pulp! So happy to read someone else has the angel/devil shoulder thing going in front of the OJ aisle. My husband likes pulp but the kids and I don’t. I like your philosophy: “Forget them! Let them buy their own.” My thoughts exactly: aren’t I the one who got in the car, drove to the store, and now selecting and buying?Fend for yourself, dear spouse! Very fun post! Thank you for visiting my neck of the woods, as well. Would your angel and devil agree to a compromise? Buy OJ with pulp and those who do not want the pulp screen it out! But don’t tell anyone Granny suggested this! ha! ha! 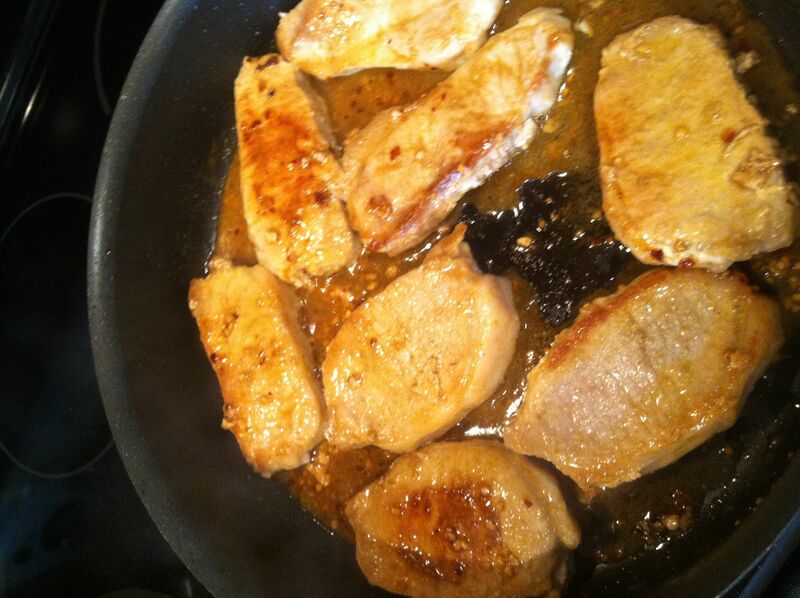 Pork chops look absolutely delicious. Another split household – I prefer pulp. Ma famille? Non. Another good one. Thanks will try it. I love pulp. And the food looks delish. Absolutely no pulp! The pork chops look great. 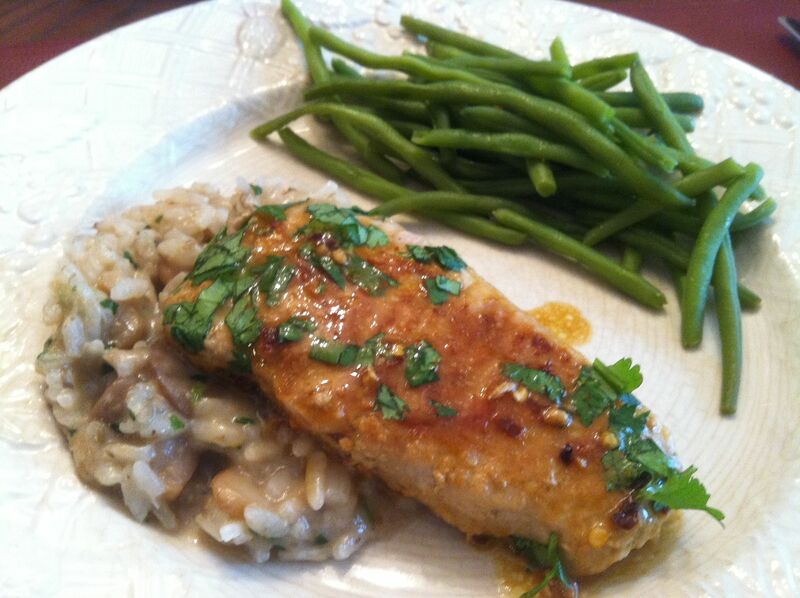 Great recipe, tried it with chicken last night… my husband and i loved it. thanks a lot for sharing!! !